The Days Inn Convention Center International Drive in Orlando is a Non Smoking Hotel. 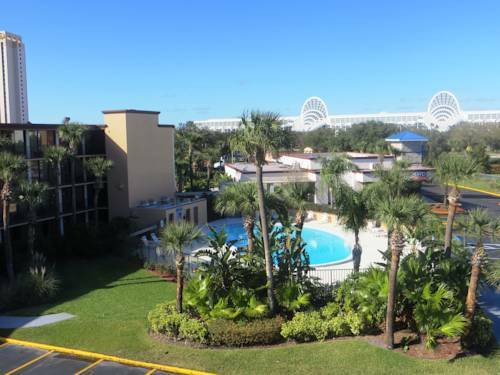 The Hotel is newly renovated and located in the heart of the I-Drive tourist corridor across the street from the Orange County Convention Center and steps from SeaWorld and Aquatica Water Park. We Offer complimentary scheduled shuttle service to Universal Orlando, SeaWorld and Walt Disney World. Enjoy our swimming pool area, and our spacious comfortable rooms. We have an International House of Pancakes on site for your convenience. Great shopping and dining are within walking distance. Fridges in all Rooms. Copy and Fax Service, nominal fee applies. Package Receiving and Storage and luggage storage , nominal fee applies. IHOP restaurant onsite fees will apply.